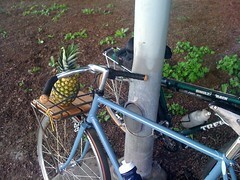 There’s a definite element of style to transporting a pineapple on your city bike. Place it properly on the custom wood rack, of course, and make sure it’s ripe. Get to the office and slice it up in the lunchroom. Share it with your fellow commuters.